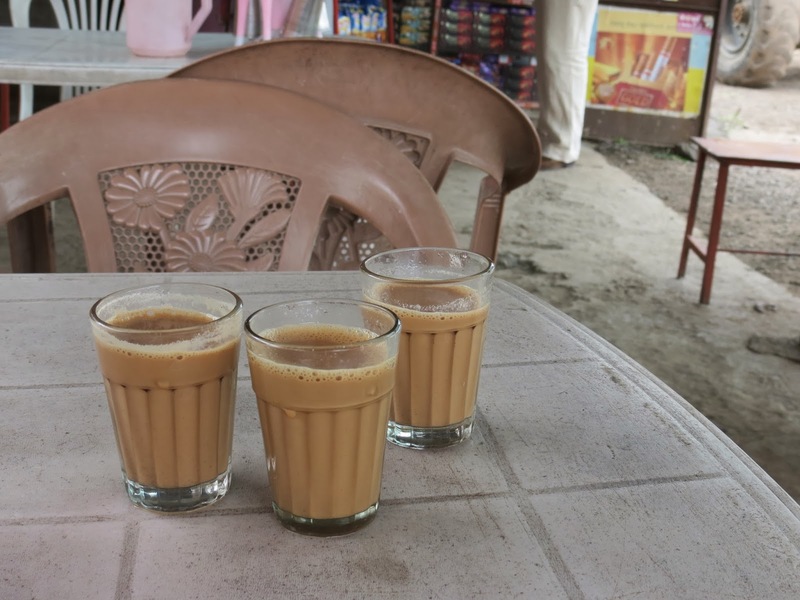 I have to admit, I am not being original in observing the ubiquity of the moulded plastic chair in India - it was noted in an article by the BBC entitled "10 things you might not know about India - No 6. 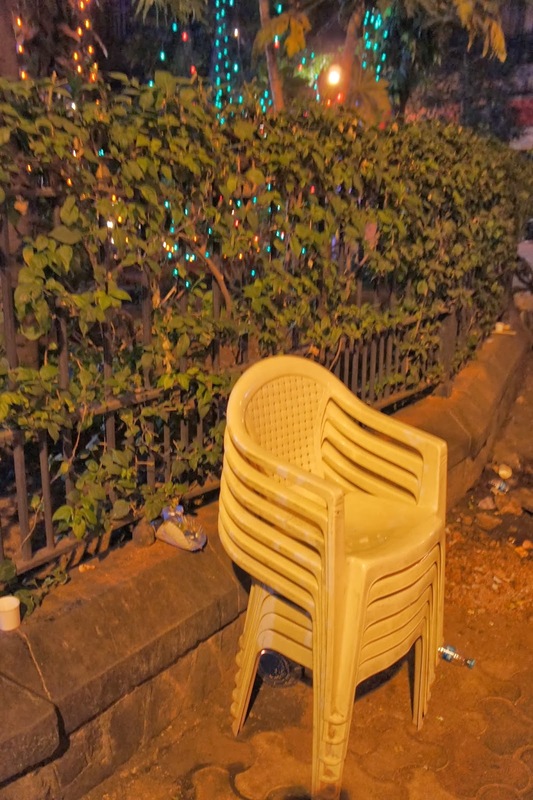 Everywhere you go, you see plastic chairs". And it is so true! There are plastic chairs absolutely everywhere! 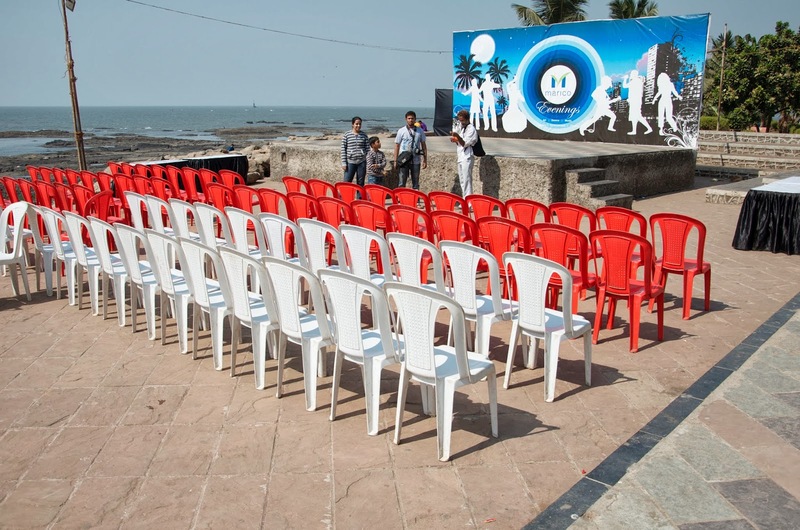 Plastic chairs at weddings, plastic chairs sat on by guards, plastic chairs on boats, plastic chairs in schools, plastic chairs on the pavement, etc etc etc. 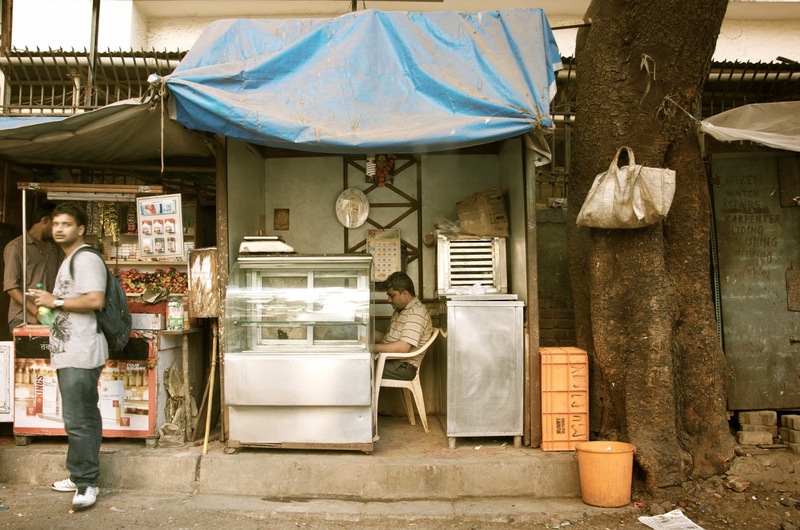 Plastic chairs are also nearly always lined up outside roadside cafes (dabbas). They come in a rainbow of colours and designs. Most are plain, some are fancy. Some are more comfortable than others. So stackable and manoeuvrable that you can even get a load on the back of a bike! But why so ubiquitous? 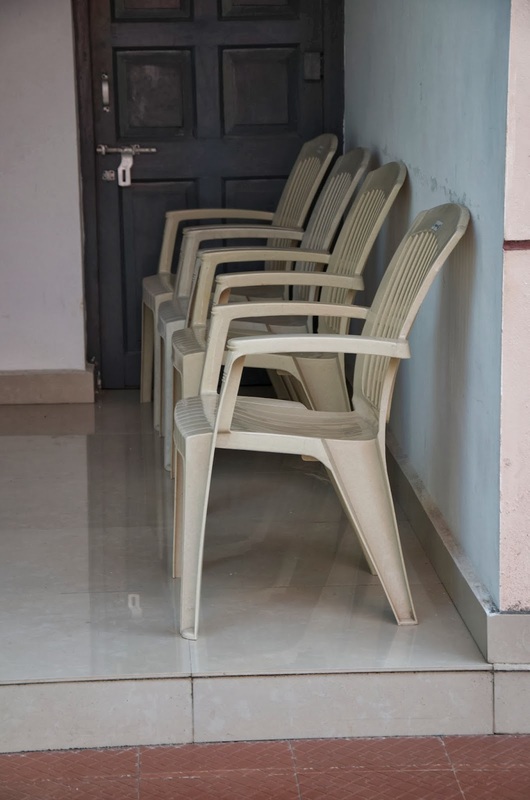 Well moulded plastic chairs are of course cheap; cheap to manufacture and cheap to buy. 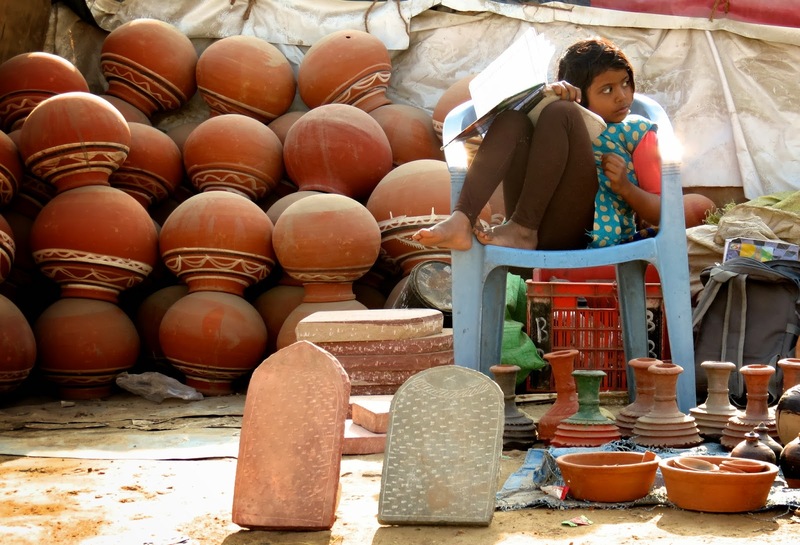 They have an amazing space saving, stackable design - so important in crowded India. Plastic chairs are colourful and cheery. They are easy to wash and they are monsoon proof. 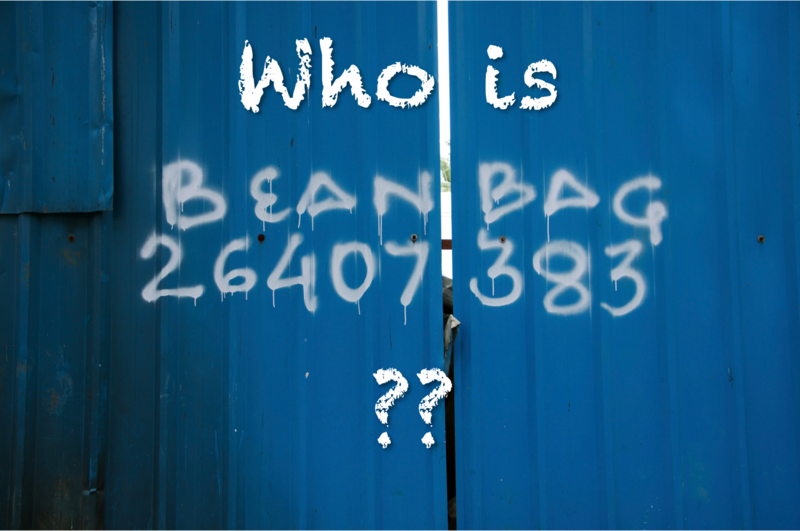 They are almost disposable and can also be easily recycled via India's plastic recycling plants. Although I suspect they have quite a long life in the first place. 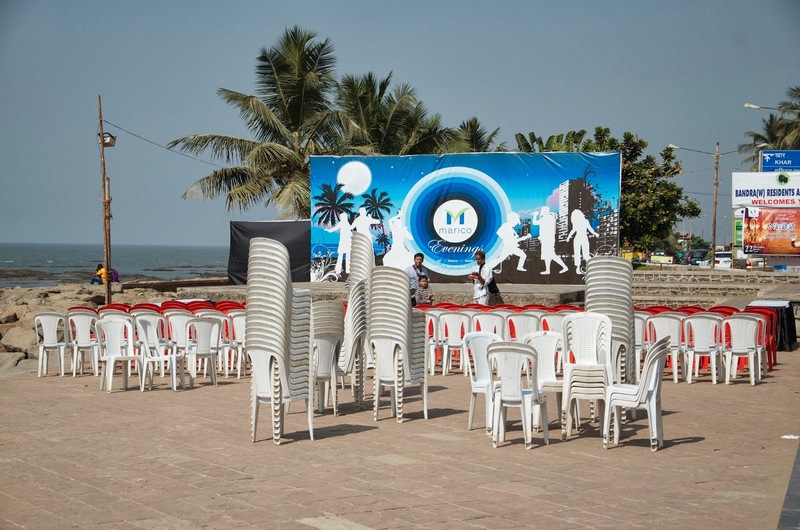 Plastic chairs are great for any 'bulk' situation such as weddings (where guests typically number 1,000 upwards), conferences, pop concerts and ceremonies. 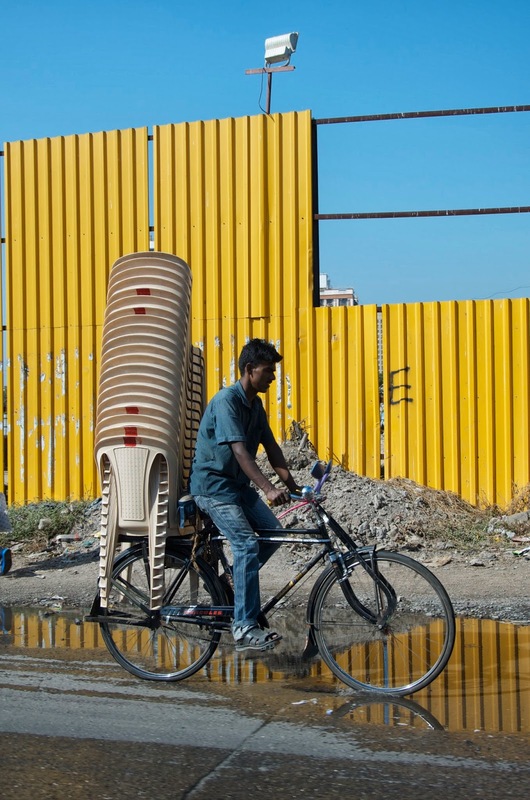 The use for the Indian plastic chair really is endless. 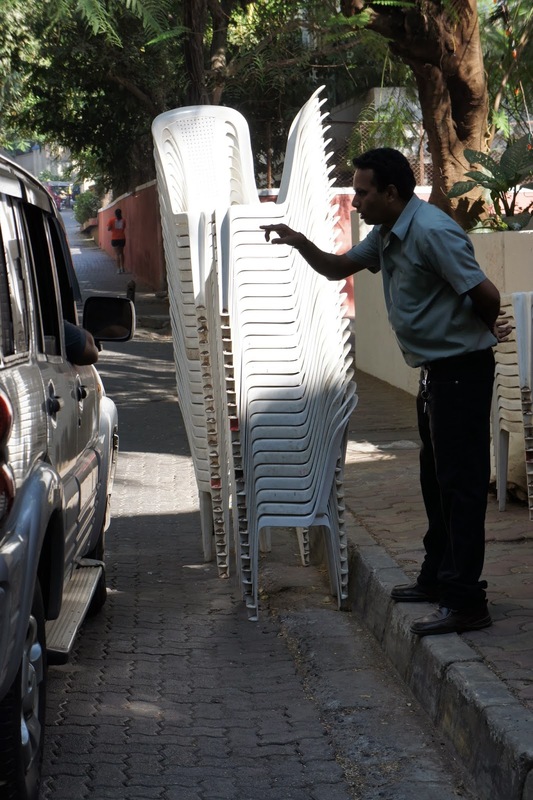 It is surely impossible to go a whole day in India without seeing a plastic chair....test yourself next time you are out and about! 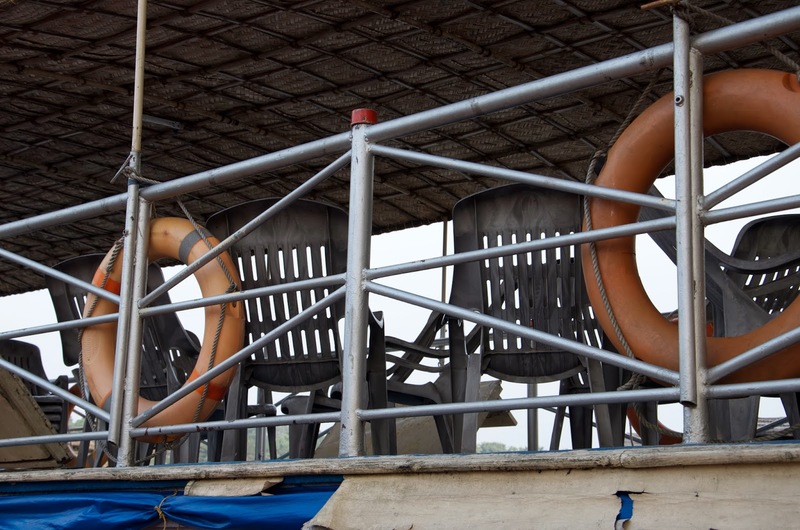 On the top deck of a houseboat in Kerala - these ones are built for extra comfort! lobby to our own building - we have plastic chairs! Thank you! Now you know that it is impossible to go a day without seeing one...! Did not realise how handy these chairs are. Some are much more decorative than any seen here in the US. 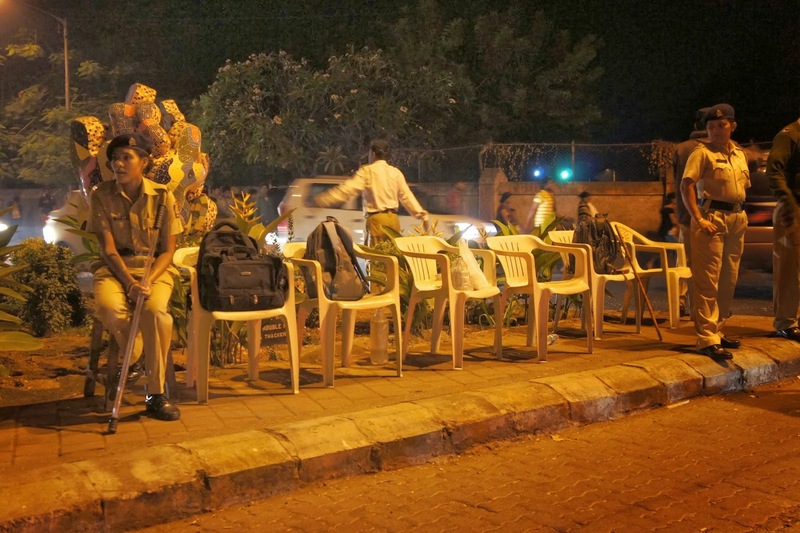 Suspect you have them in your lobby to keep anything posher from making their way to Chor Bazaar! Haha that made me laugh...you're so right! 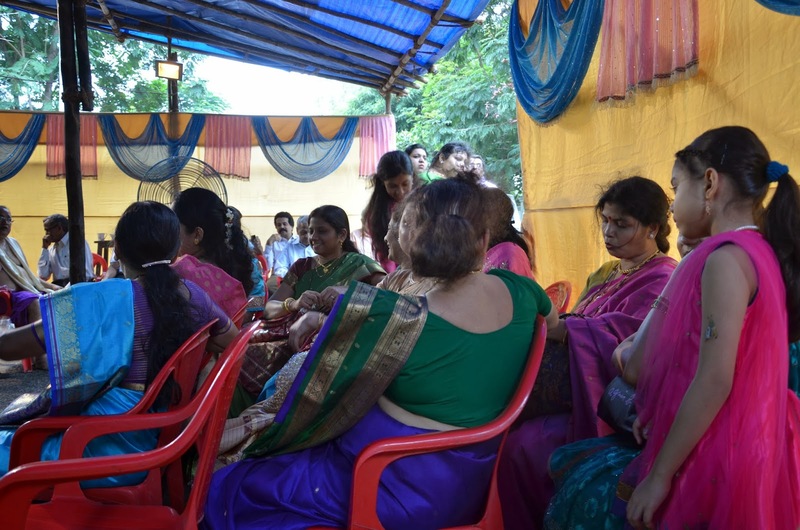 Thank you Poonam and welcome to my blog! I'm really enjoying this series. Thanks a lot for sharing, and I'm looking forward to seeing the other ones! 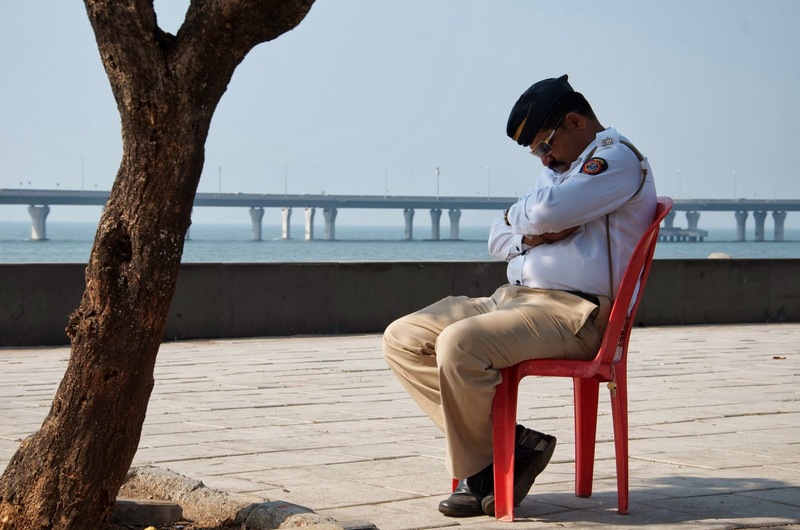 Thanks Neil and thanks for visiting BombayJules!